Google’s Hotpot is a head on challenge to Yelp, the long-standing leader in gathering local reviews in the U.S. Although Google has been soliciting local reviews for years, Hotpot is the biggest effort by Google to gather local reviews. 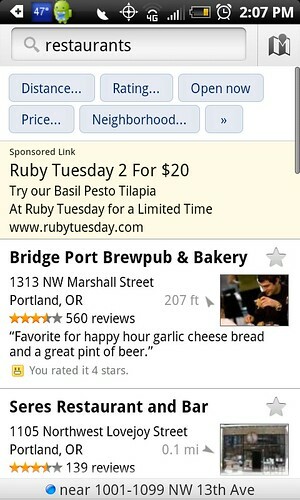 Google is accompanying the new product with a large marketing push in the Portland area. Google’s initial goal seems to be to get as many ratings as possible. To that end, it has made giving your opinion very easy. 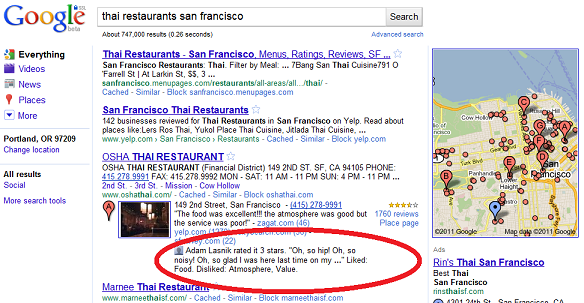 While Yelp encourages long-form reviews with a lot of detail, Google encourages basic star ratings. 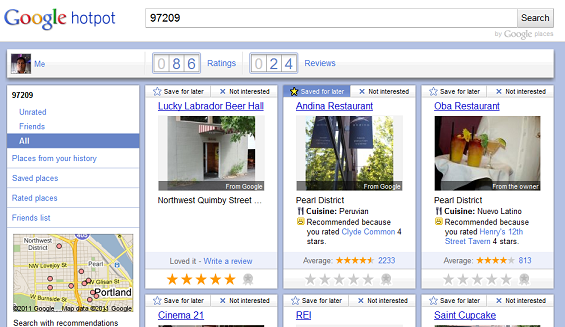 It’s primary Web interface makes it easy to quickly rate many places. Animations when you’ve completed a rating add a touch of fun to the process; once you’ve rated a business, the card flip over to allow you to write a review. The box is sized for about four sentences. Restaurants can also be sub-rated on Food, Service, Atmosphere and Value with a smiley face or frowny face. Hotpot's rating screen allows you to quickly rate many local businesses. On Android devices, a widget makes rating possible without launching the Google Places app. As you can see at the top of the screenshot, the ease of rating has the potential to generate a lot of quick hits of data — my ratio is about 4 ratings to each review. See my earlier post about using lots of small nuggets of data to make intelligent recommendations. Hotpot integrates with your search history on Google. This serves as a reminder to rate places you may have recently visited. Given Google’s vast query volume, this is another important differentiator. Hotpot also shows ratings and reviews. While Google builds up its ratings and review corpus, the page focuses on aggregated reviews from other local sites, including Yelp, insiderpages, CitySearch and others. This has been a bone of contention for Yelp’s CEO, Jeremy Stoppelman. Google hopes to make intelligent recommendations with all of your ratings data. Instead of having users sift through mounds of data to find the right business, Google does the lifting for you. Recommendations based on your previous ratings. These span venue types. For example, Ikea was recommended for me because I rated Voodoo Donuts highly. Recommendations based on the ratings of your friends. The quality of recommendations seems to be hit-and-miss so far. Some seem entirely logical; others, like the Ikea recommendation were baffling. Andina Restaurant because you rated Clyde Common 4 stars. Oba Restaurant because you rated Henry’s 12th Street Tavern 4 stars. Cinema 21 because you rated Mission Theater & Pub 4 stars. Crystal Ballroom because you rated REI 4 stars. Dante’s because you rated Jake’s Grill 4 stars. The advantage of such recommendations over, say, answering Jeopardy! questions, is that it’s hard to prove them wrong immediately. Recommendations don’t currently span metro areas. For example, if you rate places in San Francisco and then visit Chicago, the San Francisco data don’t seem to be used to make recommendations in Chicago. Google could use data like cuisine and price preferences to make at least a first cut at recommendations. Hotpot recommendations in Google search results. Recommendations are surfaced in a variety of places, such at the Google Places app, Google Maps and most importantly, Google search. In the screenshot above, you can see a recommendation embedded right in the search results. Google Hotpot shows reviews from friends. Local is the perfect place for social search: It reflects how we do things In Real Life. Friends and family are often the first places we look for advice on restaurants and nightlife. Even reviews from people whose tastes we disagree with are helpful. Google’s big challenge with social recommendations is the lack of a good social graph. I have exactly one friend feeding into my Hotpot recommendations. Other players such as Yelp and foursquare have piggy backed on Facebook’s social graph. Google can’t. And after last year’s Buzz privacy issues, Google is likely being more cautious in using other Google-collected data for a social graph. A significant problem with the recommendations is that they aren’t used as a filter. This is especially important in mobile, where screen sizes are smaller and patience is usually shorter. In one search, the top results was a recommended place. The next results that were recommended were in positions 14 and 30. In between were places that were farther away and even some places that were closed. When I searched for a restaurant in downtown San Francisco from my Android phone, the first personalized result was Adam’s Osha Thai restaurant, in position 16. The stated purpose of Hotpot is a ratings and recommendations tool; the recommended places should be at the top of the list. Google Places app for Android. Google’s mobile search app (called Google Places) is in some ways comparable to Yelp, but Yelp’s mobile app is overall still a stronger experience. Google Places provides a number of filters, including distance, rating, currently open, price and neighborhood. Additional filters (hidden behind the >>) allow you to search by cuisine or ambiance. The “Open now” filter is especially important on mobile devices, where the focus is often on the here and now. In the listings, you can see annotations such as “Open until 10:00 pm” and “Opens at 4:30 pm” for places where Google has such data. Yelp’s hours data seems to be much more comprehensive. There’s also a filter to see just the places that have been rated by friends. Oddly, there’s no way to see just the places that are recommended by Hotpot. Places shows offers from the few businesses who are using Google Offers. There’s no way to show only businesses with offers. Like Yelp, Facebook and foursquare, the Places app allows users to check in to a business. The Places app doesn’t allow users to add new businesses or upload photos. Hotpot allows you to “Save for later”, which is a great way to keep a list of places that you may want to visit later. These are integrated with Google Maps (on the desktop and in mobile) and shown as stars whenever you render a Google Map. It can be helpful when planning trips — you may discover that a shopping trip takes you near a restaurant that you’ve been meaning to visit. I have been using Yelp’s bookmark feature (and Google My Maps before that) to track restaurants I want to visit; the integration with Google Maps may have me switch to Hotpot for that. It would be nice if Hotpot let you record why you saved it for later (e.g. recommended by Epicurious, have Groupon). The biggest problem with Hotpot right now is that the overall experience doesn’t hold together. There are numerous brands being used, including Hotpot, Google, Maps and Places. In some places, clicking takes you to a map-based page, other places take you to a listings-based page. Icons and terminology are all over the board. The mobile app is similar. Maps, Latitude and Places all seem to point into similar experiences. Listing freshness. 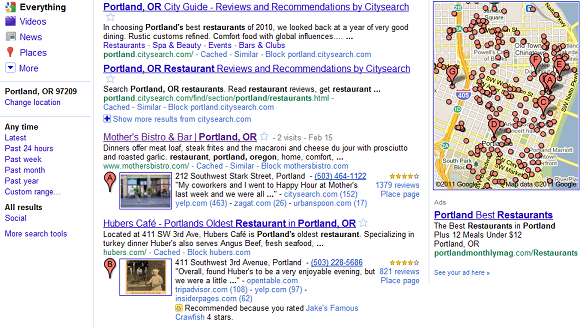 Having up-to-date listings is an important part of the local search experience. Here, Google lags both Yelp and foursquare, especially when it comes to new businesses and non-standard places such as food carts. Hotpot doesn’t seem to be designed to address this problem. There isn’t an obvious way to add new listings. Hypothetically, Google could algorithmically find new businesses by looking at search patterns and traffic to sites like Yelp. Photos. Visuals are a large part of the experience when it comes to dining and nightlife. Although Google scrapes some pictures from other sites, they aren’t using mobile apps to collect these. Instead, Google is paying professional photographers to take pictures at selected venues. Not only is this expensive and not scalable, it’s a lot less authentic. Engaged consumers. Yelp and foursquare have highly engaged users who significantly enhance the quality of the data. Engaged businesses. Facebook and Twitter have engaged businesses who regularly update content about their businesses. Apparently Google offers a similar feature, but in more than a year since its launch, I’ve only seen one business use it. I found that while doing research for this post. Tighter integration with Android. There are opportunities to improve the local experience by integrating better with the phone experience. For example, sending a message with location information could be more seamless. I’ve deliberately avoided doing a feature-by-feature checklist. Having the most features rarely matters. Flickr has been trounced in the photo sharing space by Facebook, despite having many more features for photo lovers. The sheer size of Facebook’s distribution system was enough to overcome its feature gaps. Google definitely doesn’t have the most features or the most engaged audiences. It’s not (as far as I can tell) trying to build local communities centered around reviewing places. But Google has three things that are hard to match: incredible distribution from Google search, deep pockets for promotions and Android. Facebook is the only company that can really come close to Google when it comes to distribution. Google can surely solve the branding and consistency issues that make the current product experience frustrating. The bigger question is whether Google can develop a social graph that will really drive home the benefits of Hotpot. Thanks to Mike Blumenthal for the pointer to Google’s business status updates. Disclosure: I have several good friends who work at Google and went to high school with co-founder and CEO Larry Page. I’ve benefited from free drinks and other Google schwag at various Google promotions in Portland.